This is one of the rarest Voigtlander lenses, and one of the rarest Leica Screw mount lenses. 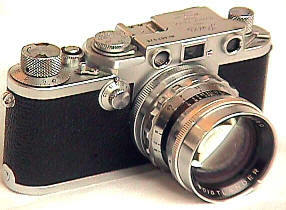 For its time in the early to mid 1950's, the 50/1.5 Nokton had the reputation of being as good, or probably better, than any other super speed normal. I was surprised by its large size and very heavy duty construction. At infinity, it measures 49mm from the filter tip to the back of the lens flange. Diameter is 51mm at the rear of the lens. Filter size seems to be an odd 45mm. Weight is a robust 12 1/2 oz. The chrome barrel has an unusual heavy chrome plating, almost giving the impression it was machined out of solid steel instead of chrome plated. It has 15 blades for that mythical perfect circular diaphragm and maximum "Bokeh." 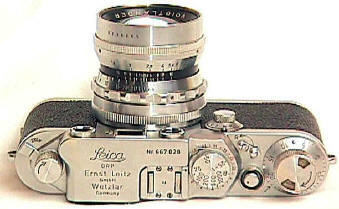 Despite Leica's justifiably great reputation for lens construction, the chrome M lenses of the 1950's are a notch below the Nokton's heavy duty quality, IMHO. 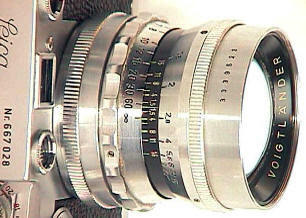 The great majority of Noktons were made in Voigtlander Prominent mount. A few like one this were made in Leica screw mount. Even fewer were made in Contax mount.